Just like every other gardener, I’m impatient. I plant seeds one day and the very next day I’m checking to see if any have sprouted. Last year, after multiple warnings from well-seasoned gardeners and farmers in our area, I ignored their advice and planted my tender seedlings out in the garden 5 days too early and watched them freeze to death 2 days later when a late cold snap brought 12″ of snow fall. That was at the end of May and I was tired of seeing friend’s Facebook posts of their gardens in California and Florida looking ready to harvest. I hope I learned my lesson. Needless to say, this post is a little early but I…as you know…I’m impatient. My intention was to wait until I had at least one harvest from our new grow tunnel before posting. Instead, I’m writing this two weeks after our first seeds have sprouted. You’ll be glad to know they’re still alive and growing. And there’s more popping up every day. There have been a few people asking how we built the tunnel so I’m going to go ahead and let you know. Hopefully, in a couple weeks I’ll be posting a photo on our Instagram account of our first salad from that same grow tunnel. Greens that will have been grown (kinda) outside in the middle of winter in SW Colorado! The purpose of a grow tunnel is to extend the growing season. Our last frost is at the end of May and the first frost is Sep 15. That makes a short growing season. A grow tunnel will allow us to plant earlier and can extend harvest time. The grow tunnel is not heated (for now) except by the sun…so, it does get cold at night. Potentially, we will be able to start seedlings in here as opposed to taking up room in the house where we do not have optimal natural light (no southern facing windows). And, of course, we are trying to grow winter greens in, well, the winter. A four season garden is the goal. Clark and I visited our friends Grant and Kathy Curry of the Permaculture Provision Project here in Cortez. Kathy and I sometimes run into each other at one of the 3-4 thrift/secondhand stores in our small town. It’s become a running joke between us about who gets the best deals and amazing finds. We had been at their place last year but were excited to chat with them and see what they had been up to lately. They took us out to see the new grow tunnels they had built and we stood in awe as Kathy harvested fresh greens, carrots and turnips for our dinner. This was in the middle of December…at about 6500′ in elevation…in Colorado. Clark and I started planning our copy-cat grow tunnel before dinner was even served. So, how did we build our grow tunnel? It started with 3 cattle panels. These are hard wire fence panels found at feed stores like IFA and Tractor Supply. Our local store carries Hog Panels and Cattle Panels for about $22 each. Both are 16 feet long but cattle panels are taller at 50″ (as opposed to 34″ for hog panels). Since we wanted as much room inside the grow tunnel as possible we opted for cattle panels and decided to use 3 butted against each other so our tunnel would be about 12.5 feet in length (50″+50″=50″=150″ or 12.5 feet). Knowing the tunnel, once wired together, would be quite heavy we tried to choose the build site well. Our prevailing winds generally come from the west so we placed the tunnel North to South (so the long side would be to the wind rather than the weaker, flat door ends). This will also allow for full sun exposure on the east and west sides as the sun moves over the tunnel (as opposed to turning the tunnel east to west and having the majority of the sun hitting mostly the southern side). Here you can kinda see the 3 panels attached to the 2 x 6 and the rebar posts are holding them in place. We decided to lay our three panels side by side and wire them together in a few spots while they laid on the ground. We also attached them to a 2″ x 6″ board along both sides using u-nails (aka staples). That means we have 3 panels laying side by side and the short side of each is attached to the board…all butted against each other. Tip: Look at your panels and see if there is a smooth side. You will be laying green house plastic on top of your panels and any exposed welds or cut ends will puncture your plastic. Try to ensure each panel is turned so that the smoothest side will be ultimately be facing up toward the sky once erected. Clark hammered 3 pieces of rebar into the ground to act as “stops” for our board to rest against. This enabled us to rest one side of the panels against the stops while we “bent” the 3 panels to create the arch. Let me tell you, three panels wired together is heavy. I believe it would be possible to build your arch one panel at a time if you don’t have anyone to help lift. You’d then have to affix them to the board and wire them together in place. We decided to make our arch 9 feet wide. We cut two 2″ x 6″ boards to 9 feet and placed them at the ends of the arch opening. That gave us the exact distance to arch our panels. I think our interior height is only about 5’8″ (give or take). If you decrease the width you will gain height but you’ll also make your interior growing space smaller. We’ve seen other blog posts that used pallets and raised beds as a base to attach the cattle panels which allowed for more height. If you’re a tall person, you might want to consider that. 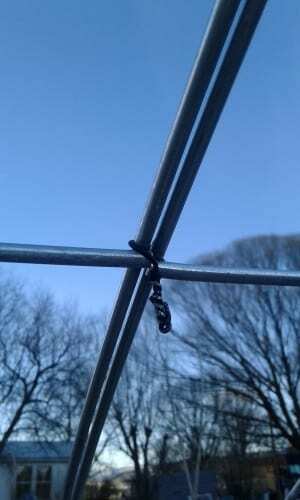 I wired every single point like this using baling wire. Make sure your wires don’t point up into the plastic but also that the ends are safely tucked so tall people don’t gouge themselves on the head when walking through the tunnel. Once we had the arches standing we used long screws (3 1/2″) to attach the boards together thus creating the frame. While I finished wiring together the cattle panels and ensuring all the baling wire was pointed away from where the green house plastic would go Clark worked on building doors for each end of the tunnel. We decided to have a door at each end but it’s not necessary. What is necessary is ventilation. Believe it or not, our grow tunnel has reached 90+ degrees (Fahrenheit) during many afternoons (yes, in the winter). You will need to have windows or doors to leave open so your plants don’t overheat. Plants also need carbon dioxide to grow. If you don’t allow fresh air in there will be little co2. We used 6 mil clear greenhouse plastic that is rated to last 4+ years. Here’s a link to the exact product we purchased. We didn’t want any seams on the main structure, if it could be helped, so we opted for the 20′ x 25′ roll even though the tunnel is only 12.5′ x 9′. We wanted enough overlap at each end so we could fold the plastic over. Our winds get high and having the overlap meant less seams for air to enter. Pipe wrap is used to protect the greenhouse plastic from ripping as we wrap it around and secure it to the wood frame. 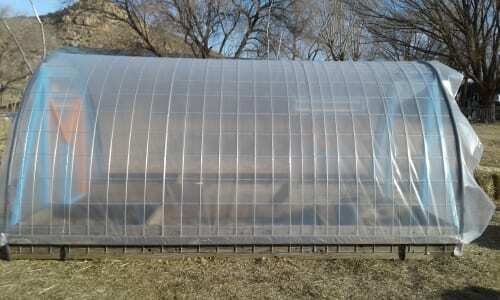 Greenhouse plastic over the main body. As you can see, we still needed to close up the ends. We cut a section to cover the tunnel (with plenty left over). Then we used a 2″ x 4″ x 12.5′ board and laid it on one of the long sides of the plastic. We wrapped it twice and secured with a staple gun (lots and lots of staples). We did the same to the other long side. Clark and I then grabbed one end of the same board and carefully lifted it up and over the tunnel so the plastic would drape over the tunnel (the boards act as anchors…any slight breeze and you’ll have a hell of time taming the plastic). Clark used long screws (3 1/2″) and attached one side to the bottom of the tunnel. We then grabbed the board on the opposite side and pulled the plastic tight against the cattle frame, rolling the plastic around the 2″ x 4″ to make it taut. He then screwed that board into the bottom of the tunnel. Tip: We used foam pipe wrap (insulation) to wrap the rim of the panels where the welded wire is cut. This way we could stretch the plastic and overlap it on the ends without ripping it. Getting ready to cut the plastic and wrap the doors and windows. Clark ripped some 2″ x 4″ boards in half (to make 2″ x 2″ roughly) and framed out the ends while I cut more plastic and covered the doors. The really fun part (you know, the kind that tests your marriage and communication skills) was figuring out how to cover each end without it a) looking like we didn’t know what we were doing (even though we didn’t know what we were doing) b) allowing the wind to tear it to smithereens c)being so wrinkled it blocked the sun. But mostly we needed it to be done before we lost our temper with each other, threw our tools in the air, and walked away forever. Oh the joys of DIY!! Installation of the plastic on the ends was a lot of “pull, tuck and staple”. Clark cut small pieces of scrap wood to act as battens to lay over seams. We painted them blue to match. We obviously survived and no tools were harmed in the making of the grow tunnel. I can’t really give details on how he did the ends because Clark is kind of a genius at making things work some how. It was basically a “measure and cut” in place and it came out great. Both doors have little windows that can be opened and closed as well. “New” raised beds made from reclaimed wood. Clark built some raised beds inside, which aren’t necessary but I love them. He used the scrap 2″ x 6″ boards we found salvaged at the Habitat for Humanity ReStore for super cheap. I lined each box with cardboard (directly over the grass…zero tilling!!) and then topped with newspaper, compost and then the decomposing straw from last year’s straw bale garden experiment. Then I scattered cool weather seeds and watered. Tip: The boxes were added before the plastic was installed so Clark could screw them together without puncturing the plastic. It took about 5 weeks before I saw my first seedling. I had pretty much given up hope. We’d had some really cold weather and, since this is an unheated grow tunnel, the temperature inside had dropped to 10 degrees on occasion. But, I was determined to at least water the beds in an effort to help the layers decompose more for future seedlings…and one day there they were…baby plants! As far as cost, it will depend on the materials available to you and, since we salvage what we can and also shop at our local ReStore our costs may be lower (or higher) than yours. *Screws, hinges, staples for staple gun…I didn’t add these up since we get most of them from the ReStore whenever we find them on sale. Often times we buy these items when they go on clearance even if we don’t need them immediately. As you can see, there is some investment to be made but after pricing out grow tunnels and greenhouses and cold frames online we found this to be extremely cost effective. We plan on building a few more in the coming months. Tip: Although building with used materials can pose a challenge (boards aren’t always straight) you can generally save quite a bit of money. Places we like to check for cheap or free building materials are Habitat for Humanity ReStore (find a store near you here), your local landfill upcycle store (some areas of the country are allowing landfills to salvage usable items, including hardware and lumber, to resell at a fraction of the cost), your local hardware store(s) (ask the manager if they sell “culled lumber”…that is, damaged or scrap lumber they can’t sell at normal pricing), building or demolition sites (We happened to drive by a building that was being torn down so I asked if we could grab a particular item I saw in the pile. The contractor in charge told me we could take anything we wanted since it would save them from hauling it away. We ended up with an entire trailer load of lumber, old doors and chairs), Freecycle, your neighbors. We are learning to embrace the challenge of building with not-so-prefect lumber. If you have any questions just comment below and we’ll do our best to help. 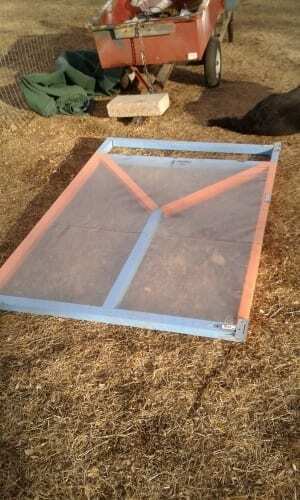 There are many blog posts, YouTube videos and tutorials on building cattle panel grow tunnels. Have fun and Happy Growing!